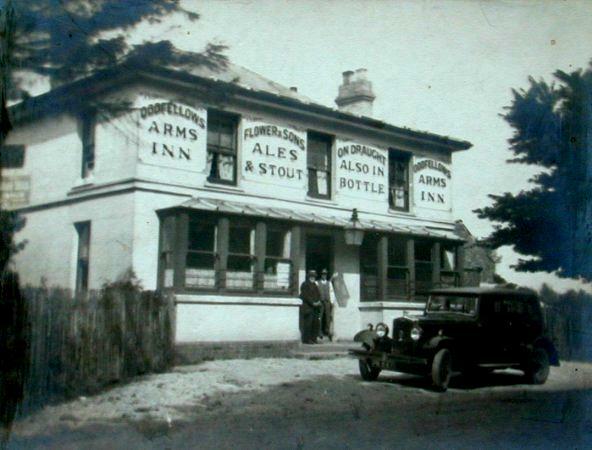 The Oddfellows Arms was situated on the western side of Shurdington Road opposite the turning to Bentham. Map reference SO 909174. It is now a private house called the Oddfellows. There is nothing to indicate that the building was once a pub. The front elevation has been re- rendered and the central door which was presumably between the two front bay windows has been removed. I believe that the last pints of beer were pulled in the Oddfellows Arms in the early 1970's. In 1891 and 1903 the annual rateable value was £18.0s.0d. and the pub closed at 10 p.m.
A fascinating article appears in this Website which deals with the Gloster Aircraft Company. ...The company, which started on 5th June 1917 eventually moved to Cheltenham. One of the disadvantages of the move was that there was no way of test flying anything nearer than an Aircraft Acceptance Park seven miles away at Hucclecote, the aircraft being towed there by a Ford lorry. It is recorded that the first time this long journey was attempted non-stop, the wheel bearings in the undercarriage overheated, as they were designed for short duration taxiing. To cool the offending component, the men urinated on the stub axle! Thereafter a can of water was carried, and a regulation stop was made at The Oddfellows Inn, Shurdington for en route refreshment! - Fascinating!